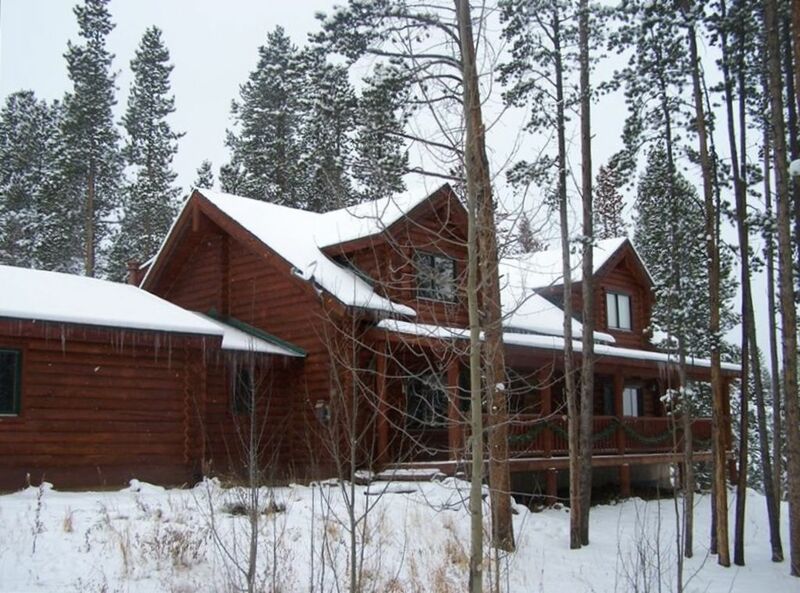 Escape to the mountains in this newer, Non-Smoking, three bedroom plus loft, beautifully furnished, log home in Breckenridge, Colorado. Located just 5 minutes (1.5 miles) from downhill skiing, and walking distance to hiking, mountain biking, and cross country ski trails. We have large screen TVs, HD, premium channels, sound bar with Huge video library appropriate for all age groups in the living room as well as wifi. There is also a 42' TV/DVD in the loft, and TV/DVD in each of the bedrooms, as well as a private outdoor hot tub. We have a fully applianced kitchen with granite countertops, new stainless steel appliances, heated slate tile floors, small appliances, including a Keurig, and huge island/snack bar. Where else in North America can you experience four world-class ski resorts, all within the same county and within minutes of one another. Breckenridge, Copper Mountain, Keystone, and Arapahoe Basin Ski Resorts offer skiing and snowboarding from mid-October to May. Winter or summer, Breckenridge has so much to offer. Enjoy yourself in the outdoor private hot tub. Shopping, dog-sledding, snowmobiling, cross country skiing, sledding, tubing, ice skating, dinner sleigh rides, snowshoeing, 18 hole golf courses, fishing, horseback riding, sailing, chair-lift rides, guided nature hikes, alpine slides, mountain biking, festivals, gold panning, whitewater rafting, and so much more! We decided to build our log home in 2002 to have a place for family and friends to visit. Because we are huge animal lovers, we decided on a home instead of a condo so we could bring our dogs with us to Breckenridge. We love the location, being so close to skiing and one block from hiking and only a short distance to town. Mountain views can be seen from the bedrooms. We would like our guests to feel at home in our home. We have very comfortable, oversized furniture to relax on after a full day. Your family, friends, and pets are welcome in our home. Your pets are very welcome in our home, however, you are responsible for cleaning up after them , including pet hair. I never write reviews so bear with me lol. This home was amazing from the hot tub guy to the wildlife and everything in between. The kitchen was stocked very well, the beds were amazing. The water pressure was great the only thing I don’t wanna comment on as being great was WiFi as we didn’t use but with that said I’m sure it was awesome too as we have zero bad things to say about our stay in this home. The travel time to peak 8 drop off is less than 10 minutes more like 5 if you have a non skier in the party. Low enough on the mountain to not have additional altitude sickness but high enough to have zero lights and some awesome fox encounters as they come right by the home. Great puzzle selection for people who don’t ski also tv channels and movie selection with a redbox at city market ten minutes away. Used some of the delivery options provided by the home owner at the home yes they even had menus for you they have provided everything you can think of. We plan to rent from the owners every time we return it was that great of an experience thank you for sharing your home with us. Thank you so much for your very kind words. We are so glad you enjoyed your time in Breckenridge. Thank you so much for your reservation. Overall the cabin was great. It is cozy but spacious enough for 13 people to include 4 adults and 4 teenagers. The kids and the adults loved the hot tub right off the back porch. It was a great way to relax after a day on the slopes. The kitchen had all the pots, pans and slow cookers to cook every meal. While the pull out beds were a bit uncomfortable, the cabin was perfect for our group which included multiple dogs. It is close to Breckenridge resort, but there is no bus service by the cabin so parking becomes more of an issue when skiing. It is also on a dirt road that can get icy/snowy so I’d recommend a four wheel/all wheel drive. Perfect place for an extended weekend. What a great house and amazing location. We will definitely be back!! Thanks so much! Wonderful time in this beautiful mountain retreat. We rented the house for a few days in January. It was exactly how it is described on the VRBO site. It was clean, spacious, very equipped, warm, cozy, well maintained. The driveway was cleared of the snow early morning so we were able to get out of the house, the spa was clean and well maintained by the company. The kitchen has everything you need for cooking. The instructions to check in and out are very clear and simple. It is definitively a house we would rent again. The owners are very welcoming and everybody in our party felt at home. We arrived on December 23rd to a decorated house that was warm, and inviting. The first thing my 3 granddaughters did was jump in the spa. It was 17 degrees out but they loved it as the water was 100 degrees. The bedrooms are cozy and decorated just what you would expect for a beautiful Log Cabin. Moose and bear quilts on the walls and beds. Everything was perfect! I really wanted to see moose but was told by the sleigh driver at Two Below Zero that they were not in Breckenridge area in winter. Only Fall and Spring. My three granddaughters saw my face fall and went to bed so upset. They decided to say a prayer for moose to come to their Nonni. Next morning as we drank coffee and looked out the window, low and behold 3 female moose came into our yard. One came within 2 feet of our window. A dream come true for a grandma and her three girls. What a wonderful Christmas. We did not see a moose but had two very nosey foxes saw my first snow, very close to the little town of Brackenridge an did some skiing and snowmobiling, great fun. The owners were very professional, nice notes all over the house to explain operating electronics and for the maids. I would recommend for any group. Beds were comfortable. We do have a standard rental agreement which we email parties that are interested in reserving our home which explains details about the house, how to make payment, etc. We do have a variable Refundable Security Deposit which is based on the number of people in the rental party and number of pets.